These days you hear the word "mentor" all the time. But when I was just starting my career twenty-five years ago that word was barely used. The official definition of mentor is "an experienced and trusted adviser". Typically it is an older, more experienced person who advises and trains a younger colleague. It wasn't until I began to examine my life for my mentors that I realized just how fortunate I have been. My very first mentors were my grandparents. I could do an entire book on my grandparents and the value they added to my life. For the first six years of my life my mother and I lived with my grandparents, and after that always within walking distance or a short bike ride to them. My grandparents were hard workers---my grandmother was Italian from a big family where she was always the caregiver and cook, while my grandpa was an army sergeant who fought in World War II and then went on to serve in the Reserves for 40 years. Upon retiring he became a jack of all trades---he could build an entire house doing everything from electrical to drywall to carpentry. He turned to gardening and built a garden that resembled how the Garden of Eden must have looked-- with fruits always hanging from the trees, grapevines and vegetables of every kind. He was the first to rise in the morning to make the coffee, and then you didn't see him again until dinner time because he was working in the garden, in the basement, on the house---he did it all. He did the dishes every night and when he went to bed he spent an hour or more reading books on calculus, history and nature. He told me I was going to be a writer---even when I told him I was going to be an attorney. In fact, while I was in law school he met the author of a book of poetry and bought me a copy, having the author inscribe it to me and wishing me luck "on my career in journalism". 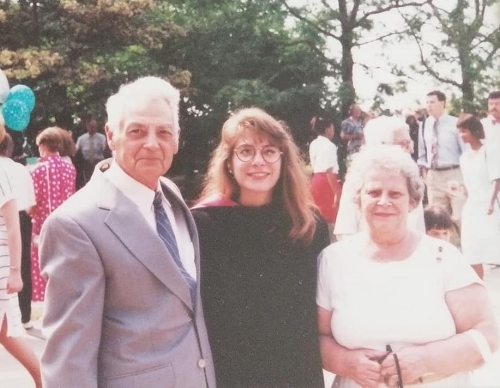 Looking back, my grandparents were my mentors because they taught me the foundation of who I am today. From the importance of making your bed every morning so that a quarter could bounce off the sheets to how to make the family sugo. They taught me the value of family and hard work, love and strong ethics. In fact, my grandpa's motto was "Anything worth doing is worth doing well". I took that to heart and that is how I work today. My grandparents also gave me my love of travel. My grandpa developed that love while in the Army ---he was a chartographer during the War and passed his mapping skills on to me as I traveled the nation with them visiting nearly every state. Needless to say, I have many more stories of them and what they taught me. My next mentor was my ex-partner John Schroeder. Following law school I couldn't get a job doing what I wanted to do---work in the State's Attorney's office or FBI, so I took the first available offered to me which was as an insurance defense attorney out in the suburbs. I didn't even know what "insurance defense" was or what I was going to be doing. In fact, I don't know why John hired me because in the interview he asked me why I wanted to be an insurance defense attorney and I am pretty sure I admitted I didn't know what an insurance defense attorney did. John was my boss and he took me under his wing and taught me everything I needed to know to become a great attorney. He didn't just tell me to do depositions---he showed me how. He believed in giving young associates cases to take to trial in order to get real experience, while at the same time taking me on as second chair on the larger, more valuable trials and then splitting up the work so I could learn even more high level skills. He even taught me how to interact with everyone from opposing counsel to the jury. John believed that when interacting with opposing counsel in the courtroom it was important that you each do your jobs, but outside the courtroom you went and grabbed a beer together. I drank a lot of beer those first few years of practice. My instruction on how to market and network began the first day on the job, as well as how to think strategically and develop a plan of action. Seven years later when the firm partners broke up John asked me to go into business with him and form a new partnership. Thereafter he taught me how to open and scale a law firm. The value he gave to me was immense and I was sad when he decided to retire. John's style was to develop strategy, guide me during execution and then and then push me, albeit gently and in his own way. He pushed me to do things before I felt ready because he knew that was the way to learn and grow. I learned to jump and take the chance that I would fly even when I felt like staying safely grounded. That turned me into the attorney I became and I can't tell you how lucky I was to have that mentorship. I didn't realize it at the time but he was teaching me to be not be afraid to fail. A couple of years ago I was feeling lost in how to grow a business that was not a legal business. I turned to the internet and social media and that is where I found my third mentor, Shawn Thomas. Shawn founded a business called Uniguest (the first to put computer centers in hotels) and sold that business for $20 million. He then started an account on social media @askamillionaire and I came across him at the beginning of his new business venture because on his account he would answer any question people asked him about running a business. I found him to be genuine and helpful so when he started a Mentorship Tribe, I joined. The Tribe is comprised of entrepreneurs across the world and there are now other mentors in addition to Shawn in the Tribe---very successful business people who are helping to advise all of the tribe members and help their businesses grow. For instance, this week I went to breakfast with one of our mentors, Barney Cohen, who built a billion dollar record distribution company. A billion dollars!!! Tom Black is another mentor with billionaire status. He is the top sales trainer in the nation. Lisa Copeland ran the top dealership in the country and now she is a serial entrepreneur and motivational speaker, while also sitting on the Board of GM. Paul David's Human Resource Company was named one of the best places to work in Southern California and is an Inc. 5000 company, Jerry Morton runs a nutrition company, Tony Drockton is the owner of HammitLA, and Peter Kozodoy is a writer and owns a Marketing Agency. These successful entrepreneurs are all now my mentors. Since following Shawn and joining his Tribe I have learned so much about growing a business, the success mindset and the importance of surrounding yourself with like-minded people if you are an entrepreneur. Successful entrepreneurs are not like other people ---they think and act differently. I've grown in ways that I never imagined was possible. My mentors help to guide me to my version of success by answering my questions, providing instruction and surrounding me with support. Shawn specifically has taught me to not fear failure. When you are with your mentors you feel a sense of belonging and peace. I've felt that way with all of the mentors in my life: my grandparents, John and now Shawn and the mentorship group. These have been the people that have pushed me forward and have believed I could fly before I even thought I was ready to walk. They make me jump and take a chance. They make me believe that I can achieve any kind of success that I want to achieve. They have all taught me that if you fail, you get back up and try again. Most importantly, never not try because you are afraid. We all have fear but we can't let fear hold us back from trying what may turn out to be our most amazing journey. The value of mentorship? It's priceless.